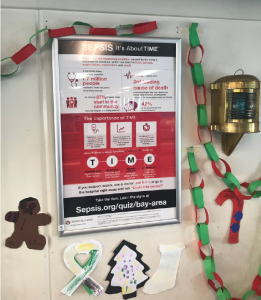 Touched personally by sepsis, two residents of Northern California’s Bay Area spread sepsis awareness in their community with the help of Sepsis Alliance. Jill Kogan Blake spent five and a half weeks in a coma. When she woke she could not control any of her normal body functions. She couldn’t do things as simple as swallowing or sitting. Why? The culprit was a medical condition she’d never heard of – sepsis. Sepsis, the body’s life-threatening response to an infection, affects 1.7 million people in the U.S. A serious medical emergency, sepsis takes 270,000 lives a year in the U.S. It is also responsible for an average of 38 amputations per day in the country (Sepsis and Amputations). Jill survived sepsis and discovered a new path. She was on a mission to save lives and limbs from sepsis. Jill started raising awareness of the signs and symptoms of sepsis in her community. She hosts the annual Aquamania! Swim for Sepsis Awareness. Jill has raised over $100,000 to date to help fund awareness programs, including Sepsis: First Response, a sepsis training video. 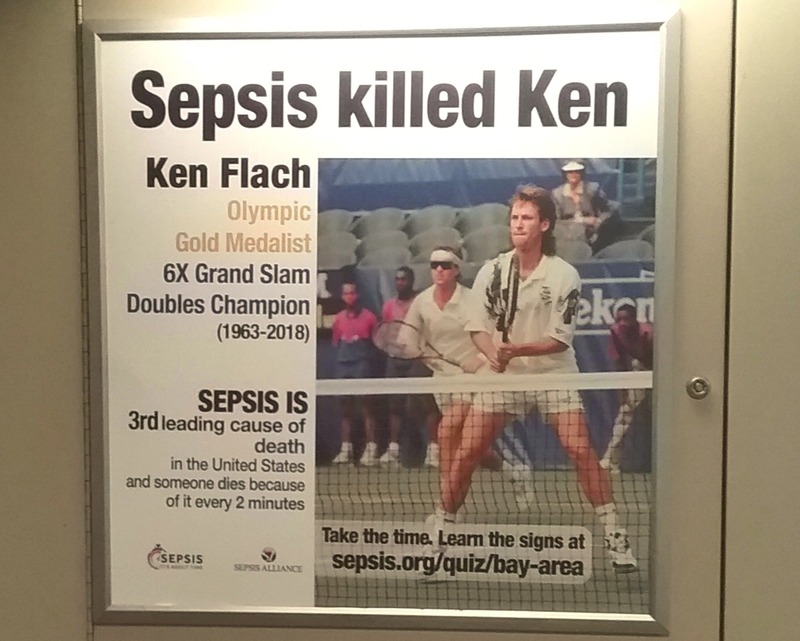 In March of 2018, Gold Medalist and Grand Slam Champion Ken Flach suddenly passed away from sepsis. Since then, his widow, Christina Flach, has dedicated her life to sharing information about sepsis in order to help prevent further deaths from the disease that took her husband’s life. Like Jill, Christina wasn’t aware of sepsis until it changed her life. The campaign features three poster designs, which are now hung throughout the Bay Area Rapid Transit (BART) and Golden Gate Ferry transportation systems. 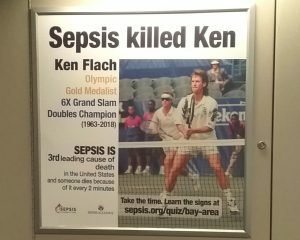 The most widespread design (above) features Ken Flach and can be found on a third of BART trains. 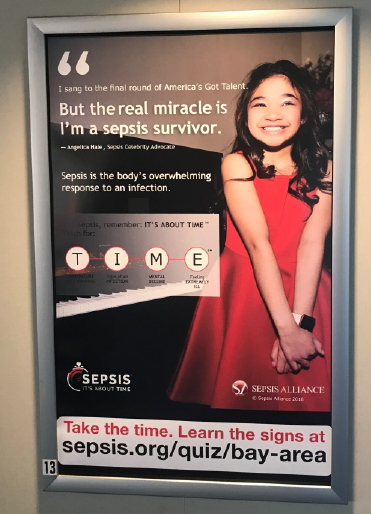 The third poster, which also appears on Golden Gate Ferry ships, educates the public about T.I.M.E and the importance of seeking medical attention as soon as symptoms are present. 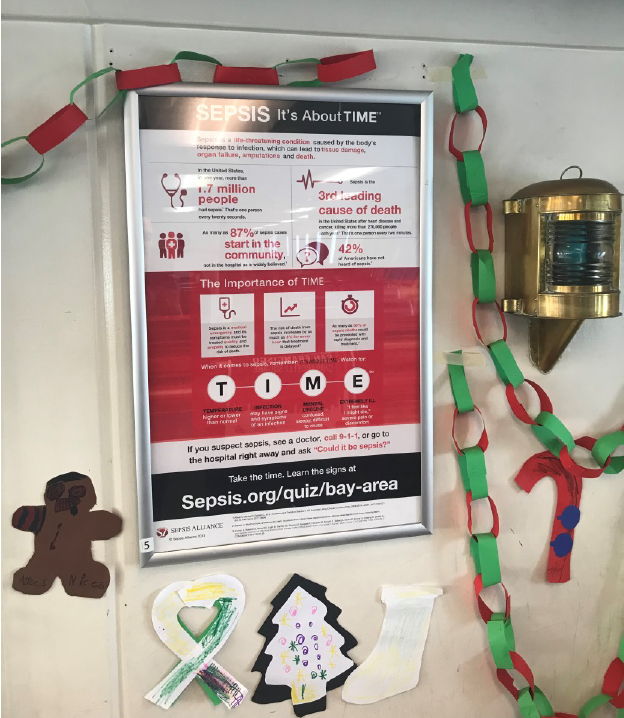 All three posters invite the viewer to seek supplementary information and increase their sepsis knowledge at sepsis.org/quiz/bay-area. “If this awareness campaign helps prevent even one death, it will be worth all the efforts,” said Christina. Take the time to learn the signs by taking the quiz at sepsis.org/quiz/bay-area. To learn more about the signs and symptoms of sepsis, click here.